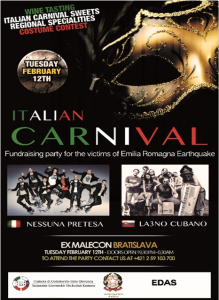 The event was animated by two musical bands: Nessuna pretesa, from Emilia, and La3no Cubano, from Slovakia. The event also featured gastronomical products such as frappe, salami, Lambrusco wine, and other typical Italian products. The event was attended by the Italian ambassador, H.E. Roberto Martini, the Italian-Slovak Chamber of Commerce Alberto Gerotto, the General-Secretary of the Italian-Slovak Chamber of Commerce Giorgio Dovigi, and by the mayor of Cavezzo Stefano Draghetti, who personally withdrew the amount of money raised during the event: € 3,668.00.